Just as the founder of Tigerama, Joe Sherman, wrote in his famous poem, “Something in These Hills,” there is something uniquely special to each individual Tiger “Beneath the Orange Colored Sky.” Tigerama 2018 sparks reflection among students, alumni and community members alike. The perfectly-painted sky signifying another day is coming to a close allows us to reflect not only on that day, but the time we have had at Clemson. It instills gratitude and admiration for this place in those that experience the iconic view of the Clemson sunsets as they fall over Lake Hartwell and the Blue Ridge Mountains. 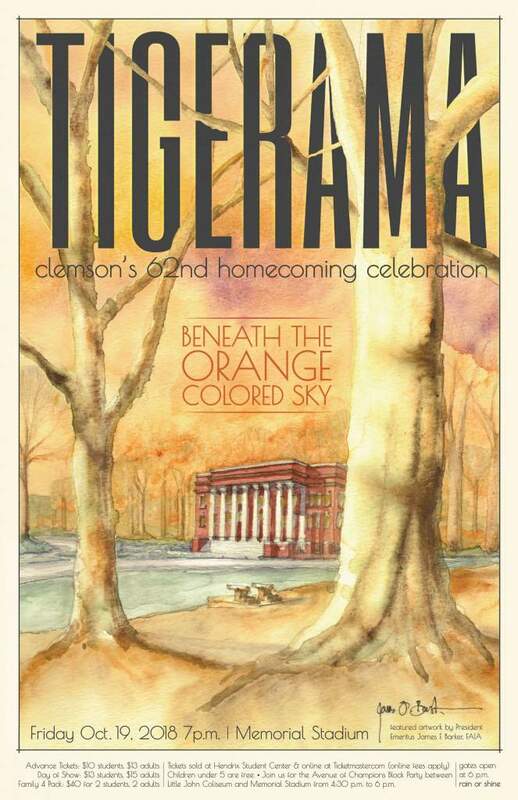 This year’s show captures our love for Clemson sunsets on a tangible level, but also guides us through the decades from what Tigerama and Homecoming have been to what each represents now. Tigerama’s 62nd show on Oct. 19 is held in its original venue, Death Valley. The evening kicks off with the pre-event on Avenue of Champions beginning at 4:30 p.m. There are kid-friendly games, food trucks, face painting and music for everyone’s enjoyment. The gates for the event open at 6 p.m., and the show begins at 7 p.m. Fans can enjoy performances by Tiger Band, TakeNote, Tigeroar, the Gospel Choir, Rally Cats, cheerleaders, students in skits, Pershing Rifles, the crowning of Miss Homecoming 2018 and our Tiger football team. We might even break a world record, too! The night concludes with paw-shaped fireworks, the alma mater and an incredible amount of spirit for the Homecoming game against NC State the next day. Fans can purchase tickets at the Hendrix Student Center guest services desk or at TicketMaster.com. Tickets for students and children in advance are $10, and adult tickets are $13. On the day of the show, tickets are $13 for students and $15 for adults. For more information on Tigerama, visit CUTigerama.com or follow us on social media, including Instagram (@cutigerama) as well as Twitter (@ClemsonTigerama). On Nov. 8, 1957, Joe Sherman and Blue Key Honor Society oversaw the inaugural performance of Tigerama, making it the second-largest, completely student-run show in the nation. Tigerama has become a hallmark event of the Homecoming weekend in Tigertown, highlighting for an audience of thousands the best of what Clemson University has to offer. Since 1957, Tigerama has been more than just a celebration of Clemson’s Homecoming, it is a unique experience for Tiger fans of all ages. Tigerama is not only a catalyst for school spirit, it is also a source of essential scholarship support. Since its founding in 1957, Tigerama and its proceeds have provided the top Clemson student from each academic major with a Tigerama scholarship, which recognizes excellence in both the classroom and leadership in the community. Thank you for assisting our efforts to foster community support and give back to the campus and student body.